When a luxury beauty brand offers products in more than 4,600 locations in 90 countries for some of the world’s most discerning clients, a commitment to e-commerce excellence is needed. Swiss beauty brand la prairie recently rejuvenated its digital strategy by adopting the Demandware Commerce platform as the backbone of its global digital commerce operations. la prairie recently launched laprairie.com, servicing the U.S., laprairie.com.au, servicing Australia, and lapriaire.co.uk, servicing the UK on the Demandware platform. la prairie has plans to launch eight additional commerce sites by 2016. Website Magazine caught up with Renee Tavoularis, vice president of global e-commerce and digital marketing at la prairie to talk about its commitment to digital strategy. How does la prairie stay true to its brand while adapting to the local cultures of the 90 different countries it offers products in? la prairie’s mission is excellence, luxury and the science of skincare in the quest for keeping skin as young looking as possible, as long as possible. la prairie’s luxury consumer is always connected – searching, shopping and sharing as she globe-trots around the world. The notion of a customer journey is no longer considered a linear path, and the lines of offline and online are more and more blurred. We look to engage our customers at any and all touch points – on and offline – via unified brand experiences through an integration of commerce, content and community. Our customer is truly a global citizen, using digital tools to help her run her life wherever she goes, and demanding the very best of experiences. We must provide excellence and consistency in digital wherever she encounters us on her travels around the globe. She's a discerning, demanding client who expects the best in service and products – and she deserves just that. Our distribution spans a variety of touch points (as of 2013, we have approximately 4655 doors), including department stores, perfumeries, Travel Retail, our art of beauty spas and of course, our digital space. The e-commerce channel of business (both our own website and our eRetailer platforms) is a key branding mechanism and a powerful tool for us. It’s not just about selling products, but it’s a place where we create luxurious, immersive, compelling brand experiences for our customers, turning them into la prairie loyalists. The website has been designed to replicate the high-touch service, personalized attention and luxurious details she knows and loves from her visits at la prairie counters with our knowledgeable Beauty Advisors. When it comes to adapting to the local cultures of our 90 different countries, we have brand content delivered on our country-specific sites that focuses on our global launch calendar, promoting new launches via assets that are translated and culturally adapted for the specific nuances of each market. Additionally, when it comes to driving sales on our e-commerce sites, we host country-specific promotions. These promotions are created and executed according to the marketing strategy of the local markets that prioritizes the needs of their consumers first and foremost. 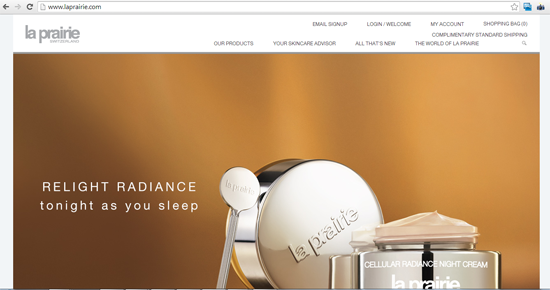 Now with Demandware, how does la prairie's commerce experience cater to modern consumers? Prior to Demandware, we had an inflexible platform that did not allow for branded content and immersive experiences – two disparate platforms and operational processes were being used for the U.S. e-commerce site and international brand sites. We strive to provide excellence and consistency in digital wherever she encounters us on her travels around the globe – and Demandware helps us do just that. By setting and maintaining global standards while allowing for local adaptions, we can ensure branding purity, which is crucial for our brand. With Demandware’s cloud platform, we, as a brand, spend less time managing technology and upgrades, and instead can focus on refining and enhancing the customer experience needed to cater to our discerning clients. Demandware also provides us with the control to both manage and deliver a consistent brand experience that demonstrates our brand’s quality and expertise in the beauty industry.